The concept of the book is pretty simple. What if Africa had enslaved Europe in the 18th Century instead of the other way around. British author Bernardine Evaristo takes this topic and creates a story of a young slave girl from Europe. Doris, who comes from a long line of cabbage plant farmers living in Europe. was snatched from her yard when she was 11 years old and sold into slavery. At that young age, she was first purchased to be playmate for her owner’s daughter, a little terror of a child known as Little Miracle. After an unfortunate incident, Doris was sent to work as a personal secretary for Bwana, a prominent persona in Aphrikan business and politics. The narrative cuts back and forth between Doris’ current situation, trying to escape her owner Bwana, and her past and childhood where we learn about the origins of slavery and its effects on Europe. There is a section of the novel where Bwana takes over and gives us a more detailed account of why Afrika enslaved Europe. That being said, I picked up this book because of the topic. Evaristo has a really skill and mastery of words to be able to make this story last for nearly 300 pages. Other reviews I read said that this book is heavily influenced by Roots, which I have admittedly never read or seen. Because of that, there are many inside themes and jokes that I missed out on. I still enjoyed the book and Evaristo’s ability to take a serious topic such as slavery, turn it on its head, and be profound, sarcastic, realistic and keep a sense of humanity in the narratives of Doris, of Bwana and others in their lives. After having learned about slavery in high school and trying to figure out the logics behind the way of thinking, ie that Africans have smaller brains, no emotions, etc, it was interesting to see it turned on its head and to se ethe same logics applied to Europe from Africa’s perspective. This book is a converstion starter, its a view of history from a what-if perspective that is accurate, brutal, but still enjoyable to read. Doris is a fantastic narrator with a great understanding of the whats and whys of slavery. We trace her life from childhood into adulthood, we see her battles, her struggles, dissappointments and accomplishments. I started reading this book at the close of 2008,so I want to say it is my favorite book that I started in 2008. So far, my favorite book that I have finished in 2009. 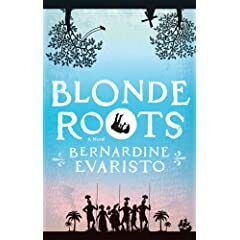 This entry was posted in Books and tagged Bernardine Evaristo, Blonde Roots, book reivew. Bookmark the permalink. Wonderful review and thanks so much for sharing. I’m looking forward to reading this one. I am glad you liked this. I thought it sounded interesting but have heard mixed reviews. I’m lisamayday from livejournal. Would you like to do a link exchange? I liked this one, too, and gave it a positive review on my blog. It’s interesting that opinions are so polarized about this book.